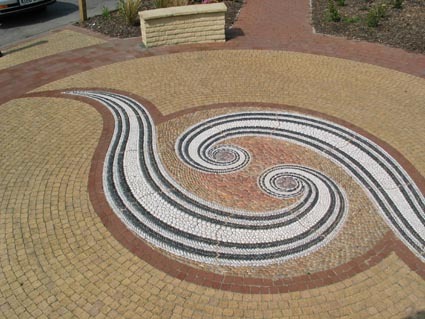 The large village of Hook in Hampshire (near junction 5 of the M3) boasts this work by pebble mosaic expert Maggy Howarth. 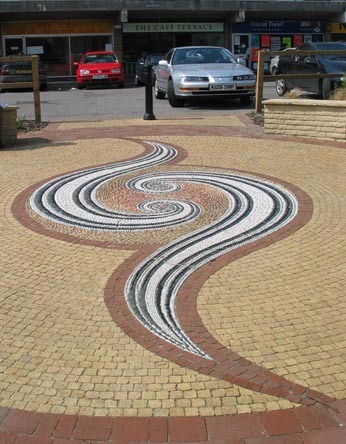 Its twin spirals lie on a thoroughfare opposite a parade of shops. The lines are very bold, with highly contrasted black and white pebbles set against a softer coloured background and radiating brickwork. The picture below shows the mosaic in context. As I was taking these photos, a passerby commented on how much the installation of the mosaic had improved this location. 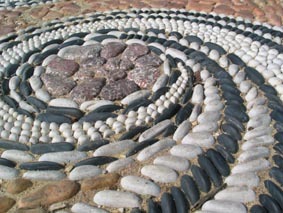 Below are details of the central motif, the "patterns within a pattern" in the stones at the heart of the spirals, and the arrangement of the rows of pebbles.